There are people who love to knit and crochet, but produce more sweaters, blankets, caps, and mittens than their friends and families can use. Yarn crafters are a generous group: in 2000, images of penguins wearing sweaters to help them recover from an oil spill prompted knitters all over the world to donate handmade penguin sweaters to the Penguin Foundation. 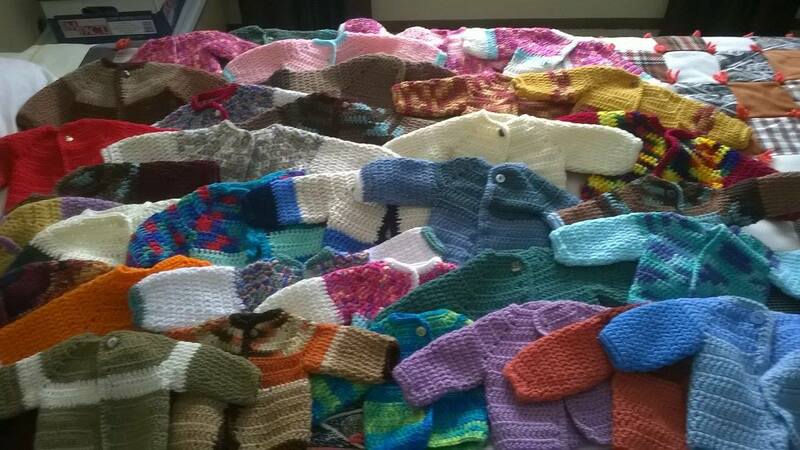 They received many times more sweaters than they wanted, and most of the tiny sweaters were sold to raise funds. There are other folks who could benefit from some lovingly-crafted woolens for one reason or another. Organizations have arisen to connect generous and productive crafters with those who could really use their output. Maybe you would like to knit for one of them. Warm Up America! was founded in 1991 by Evie Rosen of Wisconsin, who knitted afghans for homeless shelters. 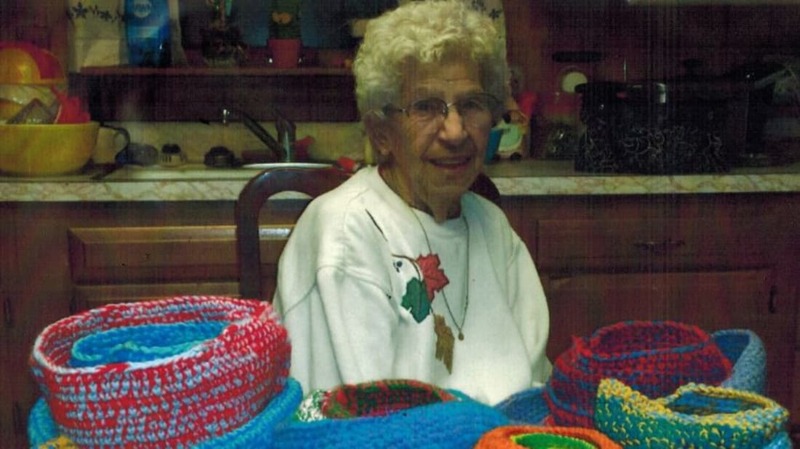 She knew she could get more people involved if they weren’t expected to make an entire blanket, but instead could donate squares that could be combined with other people’s squares to make blankets. The organization has been doing that ever since. 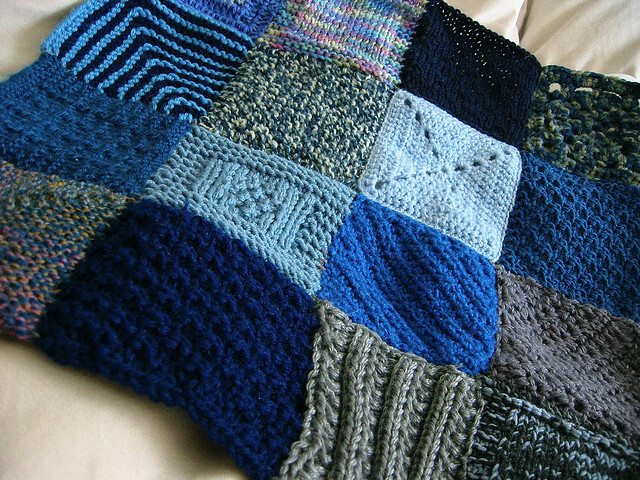 They accept individual 7” x 9” squares, as well as finished blankets and clothing items. The items are distributed to homeless shelters and hospital nurseries, as well as other charities as the need arises. Bundles of Love is a nonprofit organization that provides basic supplies for newborns in Minnesota, including bedding, clothing, and basic care items. They distribute these items to families in need through a network of 60 hospitals and organizations in the state. Bundles of Love accepts donations of knitted and sewn clothing and bedding, and they even provide patterns. But they also need monetary donations, sewing supplies, and other baby supplies for the bundles. Or you can volunteer your time if you're in Minnesota..
Wildlife Victoria is committed to helping wild animals in Australia. 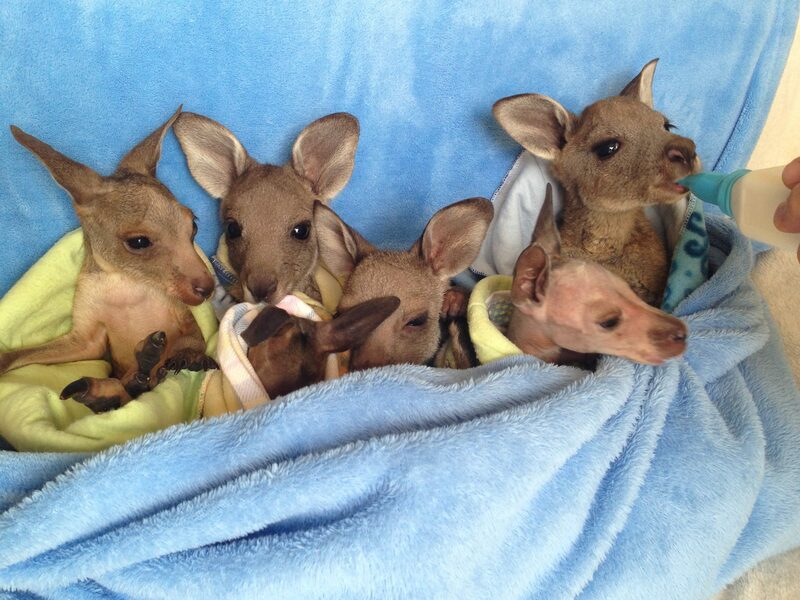 One of their projects is providing foster care for orphaned baby kangaroos, or joeys. Among the items they need knitted or sewn are pouches and pouch liners to substitute for kangaroo mothers. Other orphaned marsupials benefit from pouches, too: wallabies, wombats, possums, and koalas can use them to stay warm and secure. The instructions for making wool pouches in several sizes are here. Afghans for Afghans is a volunteer project that connects yarn crafters with the people of Afghanistan. 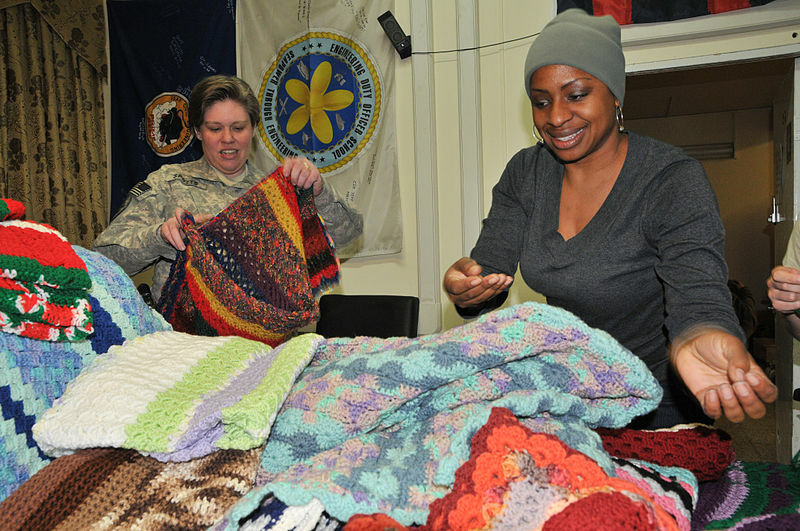 Volunteers do make the blankets we call afghans, but also wool sweaters, socks, hats, baby clothes, and other items. The 2014 and 2015 campaigns were a huge success. A new campaign is set to begin sometime in 2016. Check the community forum for updates. Binky Patrol is an organization that provides donated handmade security blankets to children in need. These include kids battling HIV, drug abuse, child abuse, or chronic and terminal illnesses. Volunteers can make blankets in a variety of ways: knitting, crocheting, quilting, or just sewing up a nice piece of fleece fabric. “Binkys” range from two-feet-square for preemies up to twin bed size, and all sizes in between. Learn more about volunteering and making blankets in this video by founder Susan Finch. Christine M. Fabiani learned to make crocheted caps, and made them for her sons. A friend remarked how she would have loved to have one when she underwent chemotherapy and lost her hair. Chemo patients are often cold in clinics and hospitals, and wigs aren’t comfortable all the time. Fabiani responded by founding Knots of Love, which provides cancer patients with handmade caps. 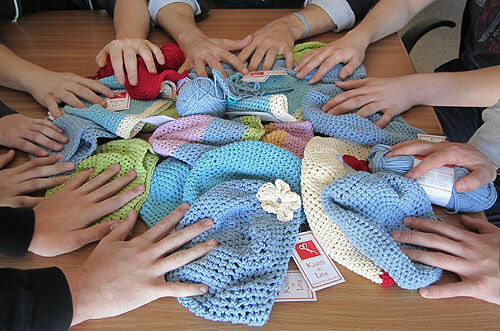 Volunteers make knitted or crocheted caps that are sent to treatment centers all over. Tens of thousands of caps have been distributed since 2007. Instructions for donating caps are here. A San Rafael, California wildlife rehabilitation center noticed that baby birds were sometimes bruised and injured in the makeshift bowls they were using for nests. WildCare sent out a call for a softer alternative, and the yarn craft community responded by knitting soft and cozy nests for orphaned baby birds to snuggle. The response was so enthusiastic that WildCare shared the nests with other bird shelters. Now organized by WildCare, the Baby Bird Nest Campaign has received over 3500 knitted and crocheted nests from volunteers from all over. A new campaign for 2016 is expected to begin in the spring. If you want to participate, you can register for email updates. See pictures from the campaign here. Knitted Knockers is a nonprofit that provides handmade prosthetic breasts to mastectomy patients. They organize knitters to make knitted cotton breasts that are lightweight, comfortable, and—most importantly—free to those who need them. 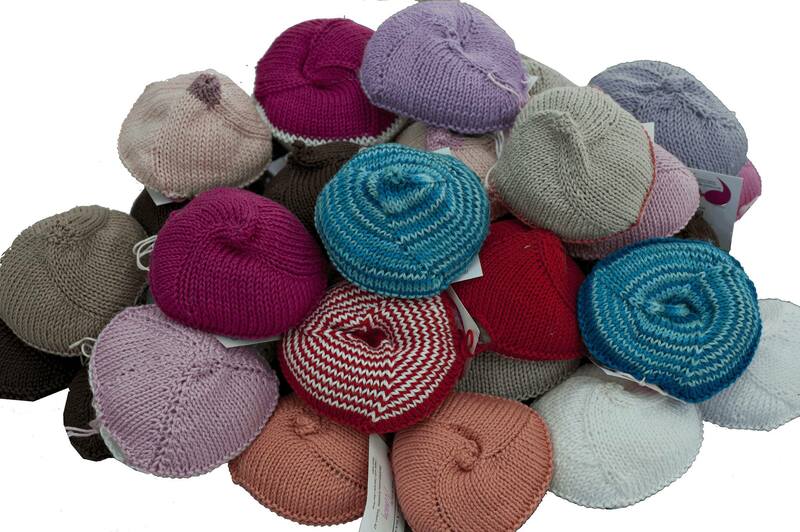 Since 2010, they have received and distributed over 5000 knitted breasts. 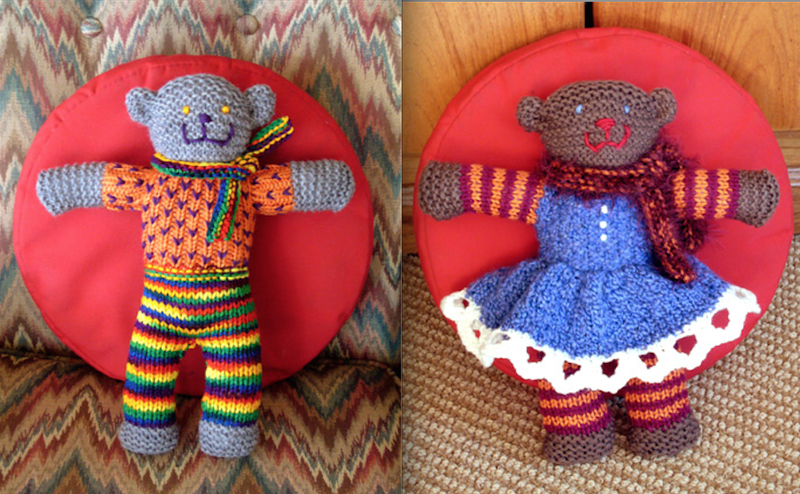 The Mother Bear Project sends knitted teddy bears to children in emerging nations who are affected by HIV and AIDS. They’ve already distributed more than 100,000 bears to children in 26 different countries. They welcome all knitters to make bears using the same pattern. The organization adds a red heart and a tag with the knitter's name before distributing the bears. Leggings for Life via Facebook. Injured and disabled animals come in all sizes, shapes, and species, and some of them need custom-made clothing and cushions for their special needs. For example, the cat pictured here, named Willow, gets around by dragging her deformed back legs. 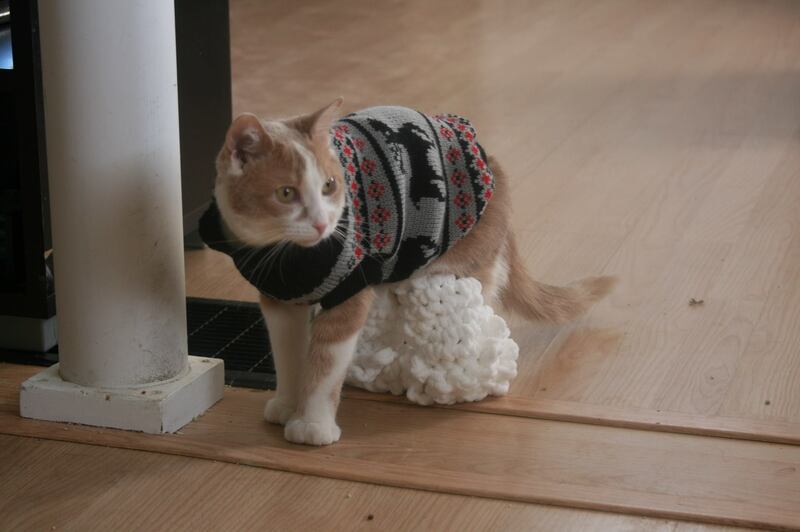 A set of custom-knitted leggings helps her slide along easier with less skin irritation. Her leggings were made by a volunteer with Leggings for Life. The organization takes requests from veterinarians and pet owners, and matches them up with volunteer yarn crafters who may live near them. This creates an ongoing partnership, since each pet has different dimensions and the leggings will wear out and need to be replaced. Even if you’re not a crafter, you can help any of these organizations with a monetary contribution. Some are also seeking donations of supplies or corporate sponsorship. See also: 9 More Charities Looking for Yarn Crafters.